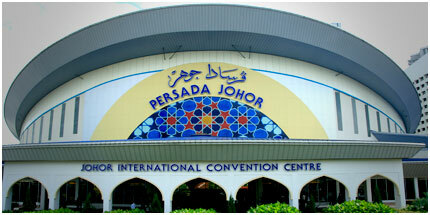 Persada Johor International Convention Centre is the principal Meetings, Incentives, Conventions and Exhibitions (MICE) venue in the State of Johor, positioned to create a market and to cater to the demand for such services in the south of Peninsular Malaysia. Persada Johor thus enables the hosting of Domestic, Regional and International Meetings, Incentives, Conventions and Exhibitions. Offering a variety of value-added facilities and services which include The Puteri Pacific Johor Bahru hotel located adjacent to it, Persada Johor adds a new dimension to Johor’s dynamic pace of economic development, showcasing to its visitors what Malaysia can offer as a destination. The Persada Johor is also strategically positioned to complement Singapore by allowing users and exhibitors, clients and visitors access to the best that both Malaysia and Singapore can offer in one location. The Puteri Pacific Johor Bahru will be the accommodation support to the convention center offering international-class hospitality blended with the renown-friendly Malaysian characteristics in service, to set it apart. Persada Johor, a member of the Johor Corporation Group, is managed by The Puteri Pacific’s team of professionals, driven by commitment to provide a product that can be relied upon for quality, safety and integrity. At the same time, Persada Johor serves as a barometer of Johor’s pulsating business, social and cultural life, one that mirrors and reflects the transformation taking place in a society that is fast integrating itself into the global mainstream.